I am trying to integrate Google Tag Manager trace code into Blogger, but getting the XML error: The reference to entity "l" must end with the ';' delimiter. After Google, I found an ampersand "&l" which hasn't been escaped properly from trace code. From the DTD (Document Type Definition), it suggests that we might use an entity as 3 parts: "&", "entity name", and ";", namely &l;. 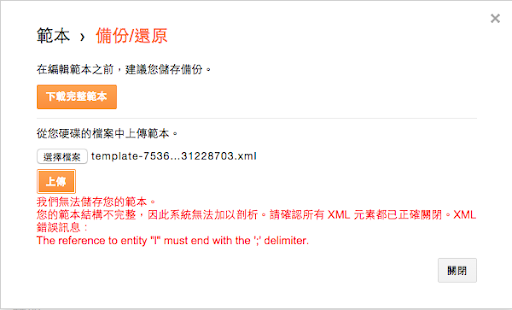 But even I used the $l; which comply the regular of DTD, the XML error message still happen. After I change to use "&amp;l", it works. Frankly, I really don't know why. It just works. Google 產品論壇 -Google Tag manager to blogger?